Baton Rouge, La. 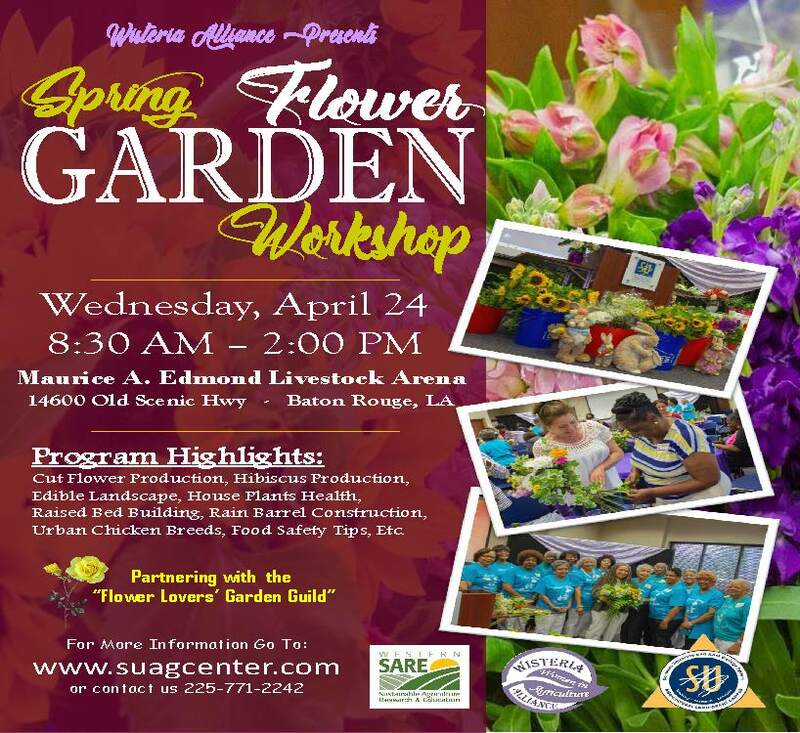 – The Southern University Ag Center’s Wisteria Alliance Program - in partnership with the Flower Lovers’ Garden Guild and the Sustainable Agriculture Research and Education (SARE) Program - will host the 3rd Annual Spring Garden Workshop on April 24 at the Maurice A. Edmond Livestock Arena, 14600 Scenic Hwy., Baton Rouge, LA 70807. Registration will begin at 8:30 a.m. with the conference opening at 9 a.m. This conference is the ideal event for gardens, flower lovers and urban agriculturalists. The Wisteria Alliance Program prepares women to own and operate their own farms and other agricultural based businesses. It began in 2012 as a pilot program aimed at providing practical, hands-on training for women who live on farms, and those whose interest lie in starting a farm, and/or urban or community garden. The Flower Lovers’ Garden Guild begin on November 20, 1953 with a group of women gathering to organize a club that would enable them to learn more about flowers, to exchange ideas about their culture and to fellowship. In March 1954, the women decided to call the club the “Town and Country Garden Club.” In October 1956, the name of the club was changed to the “Flower Lovers’ Garden Guild.” Its focus is the beautification of the community and homes with flowers and plants. 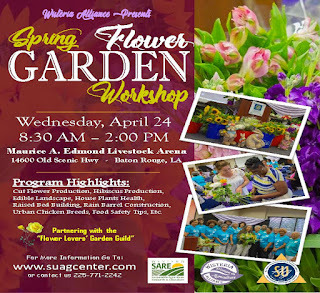 For additional information, visit www.suagcenter.com or email zanetta_augustine@suagcenter.com. Cardiologist Jay Hollmen, MD, MA, discusses the warning signs of a heart attack in men and women during the 4th Personal Health History Workshop held on April 5. The event was hosted by the SU Ag Center's Family and Human Development Unit. Baton Rouge, La. 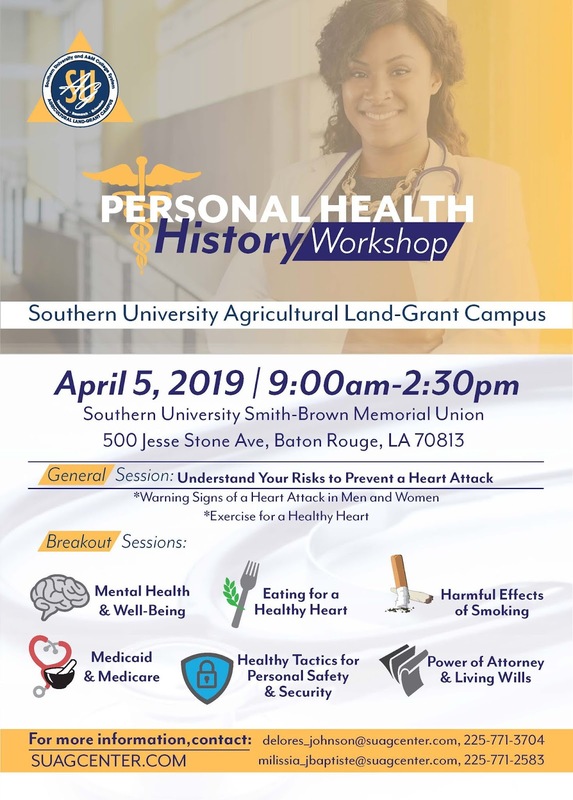 – Nearly 90 individuals learned how to remain heart healthy during the Southern University Ag Center’s 4th Personal Health History Workshop on April 5. The event was hosted by the Center’s Family and Human Development Unit in the Smith-Brown Memorial Student Union on the campus of Southern University. During the workshop, Baton Rouge area cardiologist Dr. Jay Hollman, discussed the warning signs of a heart attack in men and women and Nena Verrett-Gipson, the Coordinator of Fitness/ Wellness at Southern University demonstrated exercises to help your heart remain healthy. The workshop also included sessions on Power of Attorney and Living Wills, the harmful effects of tobacco, understanding your child’s personal health, eating for a healthy heart, healthy tactics for personal safety and security, mental health and well-being and Medicaid and Medicare. 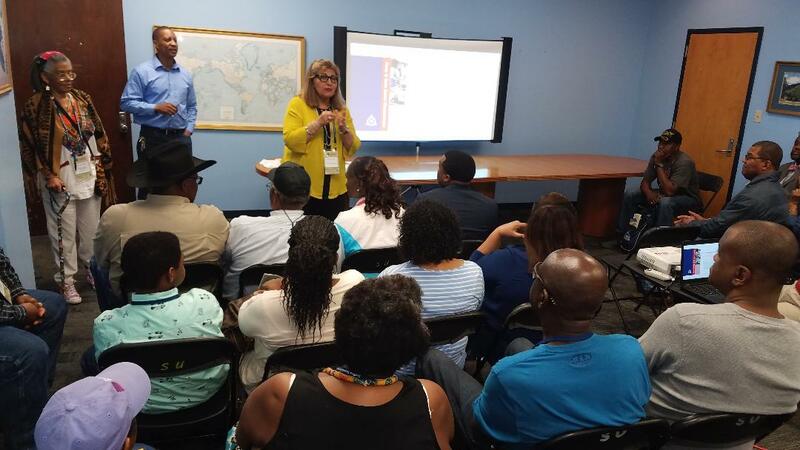 “We also provided the participants with personal health history journals to assist them in keeping track of their health conditions, medications, treatments and any past medical procedures they may have had,” said Delores Johnson, event organizer and Parent Educator at the SU Ag Center. “This information is often asked for by medical professionals when being admitted to the emergency room or seeing a doctor for the first time,” added Johnson. This is the fourth personal health history workshop hosted by the Family and Human Development Unit. The previous workshops focused on bone and joint health, developing a health journal to keep track of an individual’s person health history, proper foot care, how blood pressure and blood sugar levels respond to dietary factors, and low impact exercises. For additional information about the personal health history workshop series or the SU Ag Center’s Family and Human Development Unit, contact Delores Johnson at 225-771-3704 or Milissia John-Baptiste Cole at 225-771-2583. Photos from the workshop are available here. Youth touch a rooster during the Southern University Ag Center and College of Agriculture's National Ag Day celebration on March 26. The event was held on the lawn of the Mayberry Dining Hall and the Southern University Event Center. Baton Rouge, La. – More than 1,600 elementary, middle and high school students learned how agriculture impacts their daily lives during the Southern University Ag Center’s National Ag Day. The event was held on March 26 on the lawn of Mayberry Dining Hall and the Southern University Event Center. During the “Agricultural Block Party,” students toured several exhibits, which included live animal and food demonstrations, technology, horticulture, and family and consumer sciences. "Each year, the Southern University Ag Center and the College of Agricultural, Family and Consumer Sciences celebrates National Ag Day to teach students where their food comes from and to allow the students to journey through agriculture by gaining innovative hands-on learning experiences that they will never forget," said Dr. Renita Marshall, event organizer and chair of the department of agricultural sciences in Southern University's College of Agriculture. National Ag Day, which was recognized on March 14, is a nationwide effort to tell the true story of American agriculture and remind citizens that agriculture is a part of everyday life from the food we eat, to the clothes we wear, and the fuel that powers our vehicles. The SU Ag Center held their celebration on March 26 due to a scheduling conflict on March 14. Several members of the 2019 Blue and Gold Student Awards and Recognition Banquet Committee posed for a photo with the banquets speaker, Dr. Ron Jackson, in the Cotillion Ballroom of the Smith-Brown Memorial Student Union on March 21. Baton Rouge, La. – Southern University students enrolled in the College of Agricultural, Family and Consumer Sciences with a 3.0 or higher grade point average were honored during the College’s Annual Awards and Recognition Banquet on Thursday, March 21. The event, which was themed “Building Excellence: A Lifetime of Harvest,” was held at 6 p.m. in the Cotillion Ballroom of the Smith-Brown Memorial Student Union on Southern University’s campus. Students who participated in internship and received scholarships for the Fall 2018 – Spring 2019 academic year were also recognized during the banquet. Ron Jackson, Ph.D., Chief Learning Officer, was the keynote speaker for the event. The banquet is held annually to recognize the College’s honor students, scholarship recipients and highlight student research efforts and student clubs and organizations. The evening was chaired by Renita Marshall, Kenyetta Nelson-Smith, and Zhu Ning. 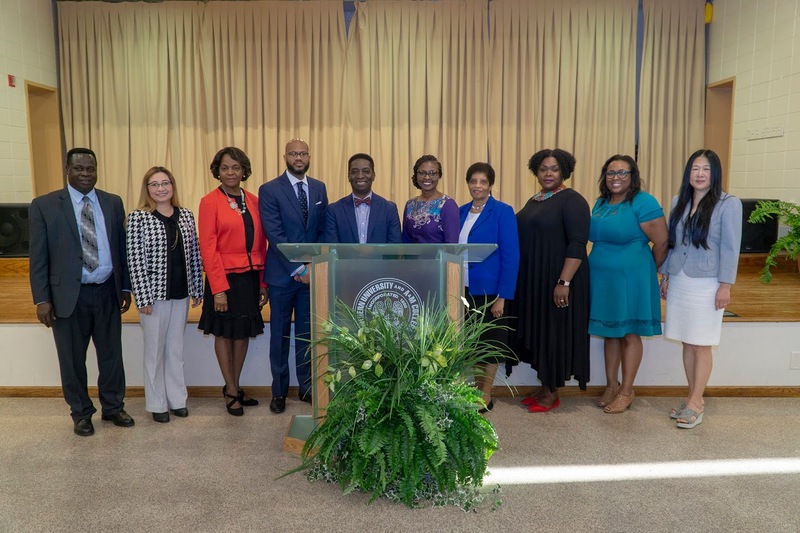 Their committee members included Yaw Twumasi, Meguna Johnson, Alice Dyson, Mila Berhane, Keisha Ceasar, D’Andre Lee, LaKeeshia Giddens Lusk, Angela Phelps, Jacqueline Dixon, Calvin Walker, Yadong Qi, Harold Mellieon, Patricia Meyinsse, Cheryl Atkinson, Gary Simon and Allison Johnson. 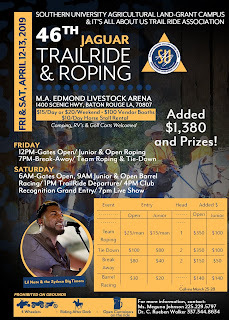 The Southern University Ag Center, along with the It’s All About Us Trail Ride Association, will host the 46th Annual Jaguar Trail Ride from April 12-13 at the M. A. Edmond Livestock Arena, 1400 Scenic Hwy., in Baton Rouge, La. Gates will open at 12 p.m. on April 12 with roping, breakaway, and tie-down activities occurring throughout the day. On April 13, the gates will open at 6 a.m. with barrel racing events starting at 9 a.m., the trail ride departing at 1 p.m., club recognitions at 4 p.m. and a concert featuring Lil Nate and the Zydeco Big Timers beginning at 7 p.m.
Cash, as well as other prizes, will be given to the winners of the events. Admission into the trail ride is $15 a day or $20 for the entire weekend. Tickets will only be available at the gate on the days of the event. Horse stall rentals are available for $10 a day. For information on participant registration, contact Ms. Meguna Johnson at 225-771-3510, 225-229-5797 or Dr. C. Rueben Walker at 337-344-8634. The deadline for participants to register is April 10. A portion of the funds raised during the Trail Ride will benefit scholarships to students in the Department of Animal Science at Southern University. 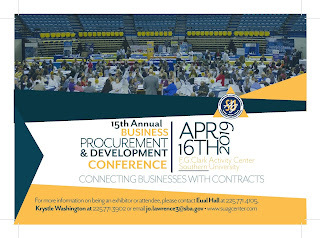 The Southern University Ag Center hosted the 9th Annual Louisiana Small Farmers Conference at the Felton G. Clark Activity Center March 14-16, 2019. Nearly 200 small farmers attended the conference. Baton Rouge, La. – Grant Writing, Backyard Birds for the 21st Century, Value Added Products, Small Ruminant Reproduction, and Ag Technology…There’s an App for That: Staying Connected were among the topics covered during the 9th Annual Louisiana Small Farmer Conference. One hundred and seventy-three small farmers from throughout Louisiana attended the three-day conference themed, “Unlocking Your Potential.” The event was held March 14-16, at the Felton G. Clark Activity Center on Southern University’s campus. The first day of the conference provided small farmers with information on grant opportunities available to them through the Southern Sustainable Agriculture Research and Education Program, as well as information on the Southern University Ag Center’s four certification courses. The second day of the conference began with an address from Louisiana’s Department of Agriculture and Forestry Commissioner Mike Strain, DVM. The conference’s keynote address was delivered by Randolph Joseph, Jr., the Assistant State Conservationists for the United States Department of Agriculture’s National Resources Conservation Service (NRCS). The day’s session included Aquaponics and Vertical Gardening, Raised Beds and Conventional Soil Amendments, Sustainability: Self-Sufficient Farming Practices, and Soil Health for Better Crops and Livestock. There was also a USDA Round Table Discussion which provided small farmers an opportunity to ask questions and learn about the programs available through the USDA. The Louisiana Living Legends Banquet was held on the evening of March 15 following the conference’s sessions. 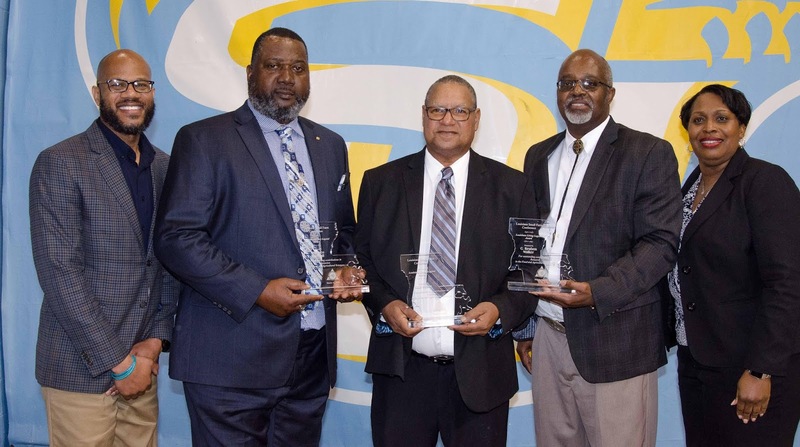 This banquet honors individuals who have made significant contributions to Southern University in the areas of teaching, research, and extension. The 2019 honorees were Dr. Gary C. Simon, Southern University Veterinarian and Professor of Animal Science (Teaching); Dr. Calvin Reuben Walker, Interim Chancellor-Dean of the Southern University Agricultural Research and Extension Center and the College of Agricultural, Family, and Consumer Sciences (Research); and Terrence S. Marshall, retired County Agent for the Southern University Agricultural Research and Extension Center (Extension). The three join 27 others who have been honored with this recognition since 2005. Alisa Welsh, Principal of Madison Preparatory Academy, served as the speaker for the banquet. The conference concluded with a Pasture Walk at Redwood Creek Cattle Farm in Ethel, La. During the walk, participants learned about electric fencing with a combination of barb wire, pasture management, cattle handling, cattle health and vaccination, record keeping, and toured the farmer’s calf daycare. Baton Rouge, La. 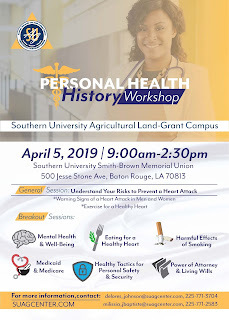 - The Southern University Ag Center’s Family and Human Development Unit will host a free Personal Health History Workshop from 9 a.m. – 2:30 p.m. on April 5 at the Smith-Brown Memorial Student Union, 500 Jesse Stone Avenue on the campus of Southern University. This is the fourth personal health history workshop hosted by the SU Ag Center. 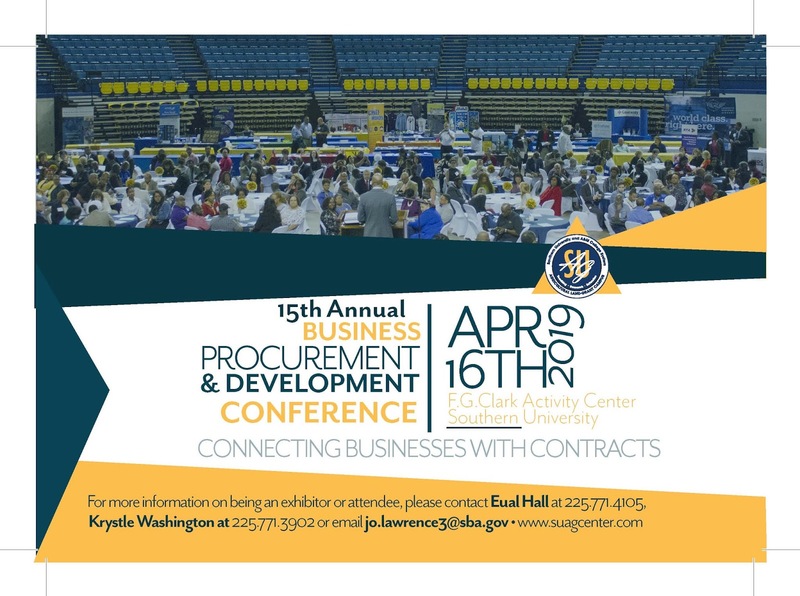 Pre-registration for the workshop is required no later than April 2, 2019, for attendees and March 28, 2019, for vendors. Online Registration is available here. For additional information about the Personal Health History Workshop, email Milissia_jbaptiste@suagcenter.com or delores_johnson@suagcenter.com, or call 225-771-2583 or 225-771-3704. 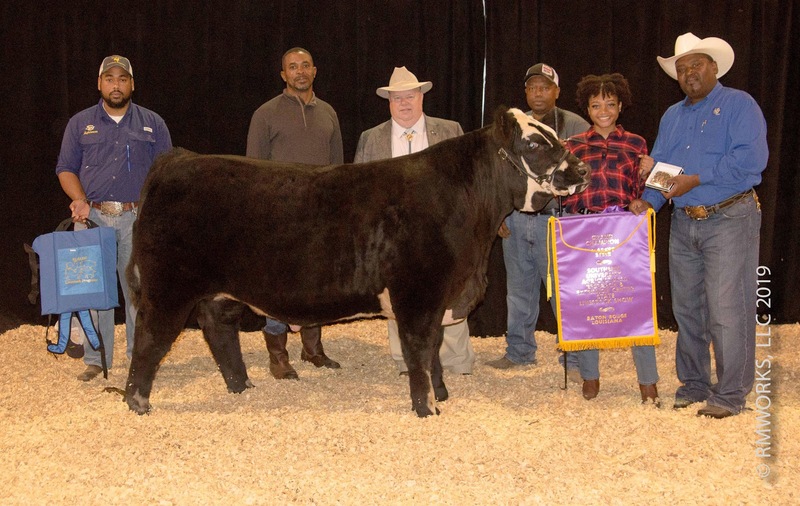 Tangipahoa Parish native, Mashayla Dyson's steer was named champion in the market steer category during the Southern University Ag Center's 76th Annual State Livestock and Poultry Show. The event was held Feb. 28 - March 2 at the Maurice A. Edmond Livestock Arena. Baton Rouge, La. 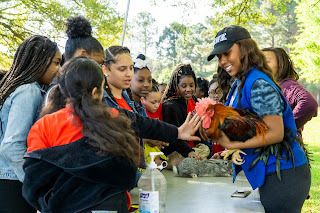 - For 76 years, the Southern University Ag Center has continued the tradition of providing an opportunity for youth, throughout Louisiana, to gain valuable knowledge and skills at its Annual State Livestock and Poultry Show. 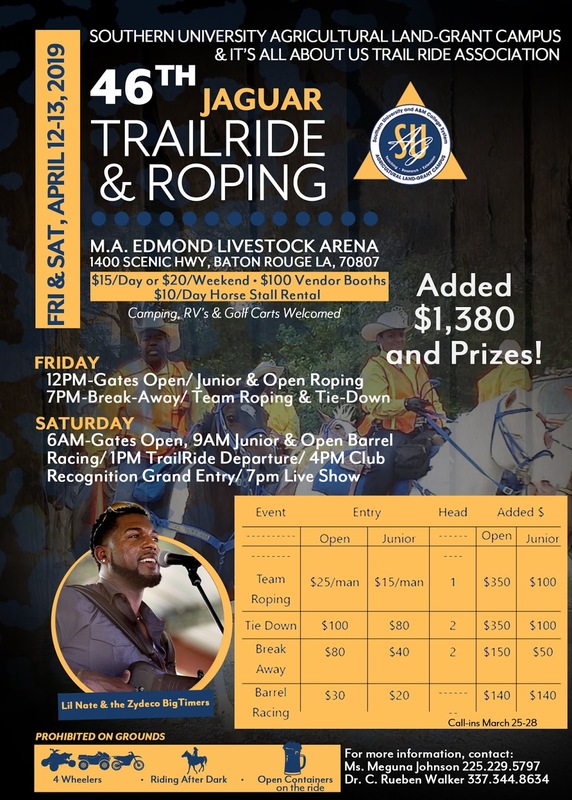 The event was held February 28 - March 2, 2019, at the Maurice A. Edmond Livestock Arena. To qualify for the state show, competitors had to have won first place at a parish livestock show. This year, 120 young people from 31 parishes showed 204 animals in various breeds of dairy and beef cattle, lamb, goat, and poultry. “My uncle introduced me to raising and showing steers,” said Mashayla Dyson, who took home Champion in the Market Steer category. 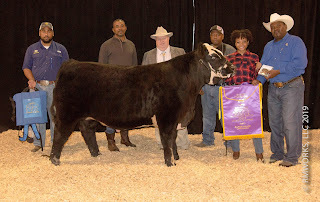 “I have been showing steers since I was 11-years-old and I have really grown to love raising the animals and showing them at Southern’s Livestock Show,” added the 18-year-old Tangipahoa Parish native. “I hope I’m able to continue doing this,” she said with a smile. The Ag Center also holds a “Night with the Stars: Old Fashion Livestock Decorating Contest” during its Livestock Show. This event is held on Friday after all the animals have been judged to give the participants an opportunity to have fun with their animal, one last time before the Jr. Auction on Saturday morning. Wyatt Sonnier, from Jefferson Davis Parish, in 1st place; Brady Hayes from Allen Parish, in second place and Camille Sonnier from Jefferson Davis in 3rd place. The following is a list of additional winners in various livestock and poultry categories and their home parishes. Each winner received a premium, ribbon, rosette and trophy belt buckle. View photos from the 2019 Livestock and Poultry Show here. 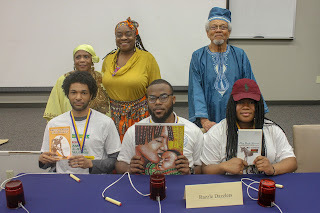 The SU Land-Grant Campus celebrated its 25th annual Black History Quiz Bowl on February 28, 2019. The event was dedicated to the legacy of Dr. Raymond Lockett. Baton Rouge, La. – The 25th Annual Collegiate Black History Quiz Bowl was held on Thursday, Feb. 28 at 3 p.m. in the 3rd Floor Auditorium of T.T. Allain Hall. Opening remarks for the event were given by Southern University Ag Center and College of Agriculture’s Interim Chancellor-Dean, C. Reuben Walker, Ph.D. Owusu Bandele, Ph.D., SU Land-Grant Campus Professor Emeritus and the Quiz Bowl’s creator, served as the event’s moderator. Awards were presented to the winner by SU Ag Center’s Research Associate Erica Williams Mitchell. 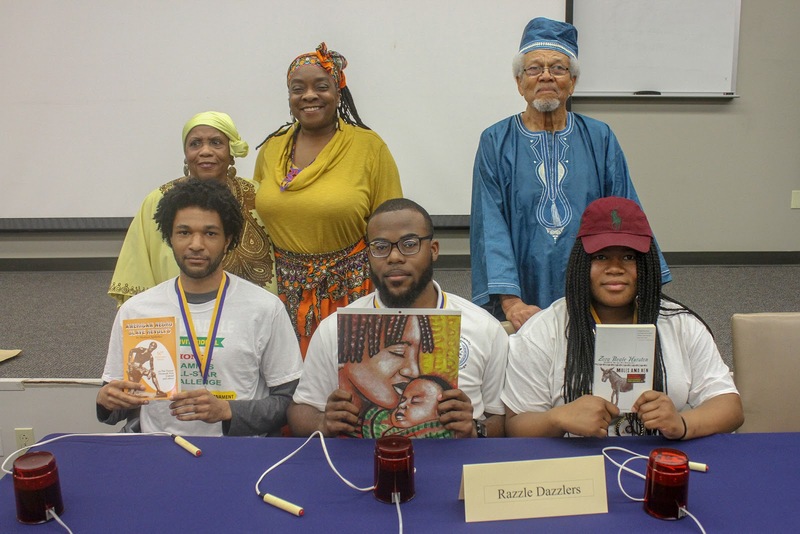 The event was dedicated to the legacy of distinguished historian, professor and teacher Raymond Lockett, Ph.D.
Four teams of Southern University students competed in the competition. Team Razzle Dazzlers consisting of Joyner Deamer, Jera’Nea Garner-Donald, Kelvin Wells and Jordan Wilson-Smith won 1st place; Team Power Rangers consisting of Alesha Bethea, Jalen John, William Waddell and Karriem Upshaw placed 2nd and Team Animal Science consisting of Samantha Jones, Tanisha Poston, Brittany Simon and Asiah Sasi placed 3rd. All three teams were made up of Southern University students. The Black History Quiz Bowl is an exciting educational event that stimulates our students. The competition covers a variety of topics, including current events, politics, history, sports and entertainment. The 1st, 2nd and 3rd place winners received medals and every participant received a book by or about some aspect of the Black experience. For more information on the Black History Quiz Bowl contact Owusu Bandele, Ph.D. at obandele@cox.net. Photos from the competition can be viewed here. Episcopal High School's Umoja Team took home first place during the SU Land-Grant Campus' High School Black History Quiz Bowl Championship Competition on February 27. Baton Rouge, La. 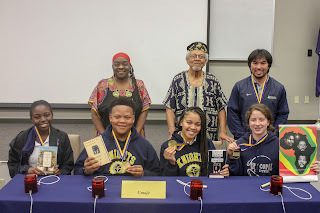 – Six teams of high school students from McKinley Senior High, Scotlandville Magnet High, Southern University Lab, Episcopal and Indira Mira Institute competed in the Southern University Land-Grant Campus’s High School Black History Quiz Bowl Championship on Feb. 27, 2019. The competition was held in the 3rd Floor Auditorium of T.T. Allain Hall. SU Ag Center’s Vice Chancellor for Extension, Dawn Mellion-Patin, Ph.D., provided the opening remarks for the event and SU Land-Grant Campus Professor Emeritus and Black History Quiz Bowl organizer, Owusu Bandele,Ph.D., served as the event’s moderator. Awards were presented to the winners by SU Ag Center’s Research Associate, Erica Williams Mitchell. Episcopal’s Umoja Team consisting of Justin Thompson, Madison Bell, Zykia Howard and Sean Moraes, took home 1st place; followed by Scotlandville’s Period T Team consisting of Bryce Hudson, Cadarius Moore, Trimell Carey, Neiyo Sumo and Johnny Williams in 2nd place and Indira Mira Institute’s Team BR.U.H.S. consisting of Jesscia Fisher, Naimah Frazier, Calista Joseph, Cyntrell Smith and Robert Joseph in 3rd place. The competition covered a variety of topics including current events, politics, history, sports and entertainment. 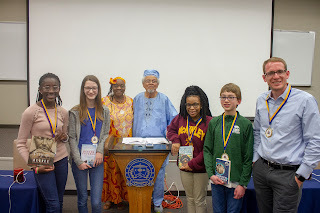 Members of the 1st, 2nd and 3rd place teams received medals and every participant received a book by or about some aspect of the Black experience. McKinley Middle Magnet School's Sting Like A Bee Team placed first in the SU Land-Grant Campus' Middle School Black History Quiz Bowl on February 25, 2019. Baton Rouge, La. – Teams of eager middle school students competed in the Southern University Land-Grant Campus’s Middle School Black History Quiz Bowl Championship on February 25 in T.T. Allain Hall’s 3rd Floor Auditorium. Earlier in the month, SU Land-Grant Campus Professor Emeritus and Black History Quiz Bowl organizer, Owusu Bandele, Ph.D., conducted Black History Quiz Bowls at several schools throughout the parish. The first and second place teams from each school were invited to participant in the championship competition at Southern University. Dr. Bandele served as the event’s moderator and NBC Local 33 Anchor Deon Guillory also served as a guest moderator for a round of the competition. McKinley Middle Magnet’s Sting Like A Bee Team took home 1st place; followed by Westdale Middle School’s Soul Train Team in 2nd place and Scotlandville Middle Pre-Engineering Academy’s Black Kulture Kids Team in 3rd place.